A young upstart band, Outlaws & Moonshine are on to something good, maybe nearing the cusp of greatness. 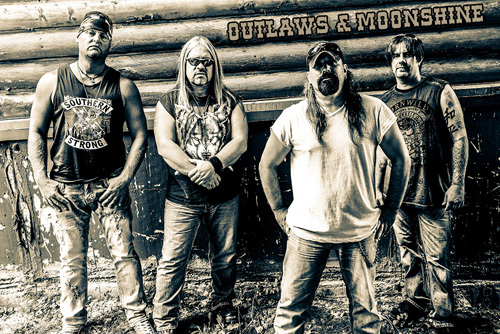 Put them at the forefront of the New Wave of American Southern Hard Rock. They debut with their first EP, 1919. And, damn, I like everything about this band. But some explanation is required to start, especially for non-Americans. First, being an outlaw and moonshine go hand in hand. Moonshine, the distilled spirit famous in the American south, was and still is, illegal to produce and sell. To do so made you "outside the law". Second, the album title, 1919 refers to inception of the "nationwide constitutional ban on the sale, production, importation, and transportation of alcoholic beverages". So what did the good folks of the South (and elsewhere for that matter) do? Yup. They made their own. Moonshine. But it was something they were doing in the hills for a long time. So much for the history lesson, what about the tunes? Not to call them a "throwback" or "retro" band, but O&M revisits the Southern hard rock that made America famous in the Seventies. Yet the push their tunes through later revivals like Shooter Jennings, Black Crowes, or Black Stone Cherry as well. Underneath everything is essential hard rock melody and groove. Simple. Now toss in some Southern guitar, even some deep South blues, slide guitar, maybe a little Dobro. And vocalist Beau Van has that Southern sound: bit gritty, bit grizzly, definitely whiskey soaked. As for the five song set, three songs, all rockers, revolve around Southern party shenanigans. Not the least of which is drinking shine from a Mason Jar (Cootie Brown), downing some bourbon or sour mash on the back porch (Whiskey), and shouting out loud, party style, about it (Hey Y'all). But these things are explained easily in the songs Redneck Me and Different Kind of Man where, dialing back on the rockers, these hairy hillbillies reach for their softer side or not, especially with that latter song. "I'm a redneck, baby. That's what I am. Stand by your man or leave." You get my drift. 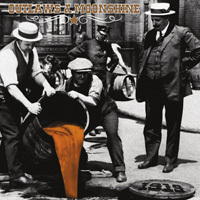 Wrapping it all up, Outlaws & Moonshine's 1919 is fundamental, lively and entertaining, Southern hard rock. Unfortunately, unlike their early predecessors, Outlaws & Moonshine probably won't have the reach like, say, a Lynyrd Skynyrd. But here's hoping they do, even in the contemporary country music environment. But thinking of that, here's also hoping they go over to Nashville and kick the asses of those auto-tuned country rock pussies. Outlaws & Moonshine's 1919 is quite recommended. Outlaws & Moonshine's 1919 is fundamental, lively and entertaining, Southern hard rock. Unfortunately, unlike their early predecessors, Outlaws & Moonshine probably won't have the reach like, say, a Lynyrd Skynyrd. But here's hoping they do.